There are some skills one might not think about when beginnging the journey of educating children- whether at home or in cooperation with a school. Kids don't just need to know how to read. They need to know how to read out loud. You want them to be able to read in a way that is clear, expressive and engaging. You want people to be able to understand what they say and to actually want to listen to them. Most skills must be cultivated. So, I started researching how to teach a child to read aloud. 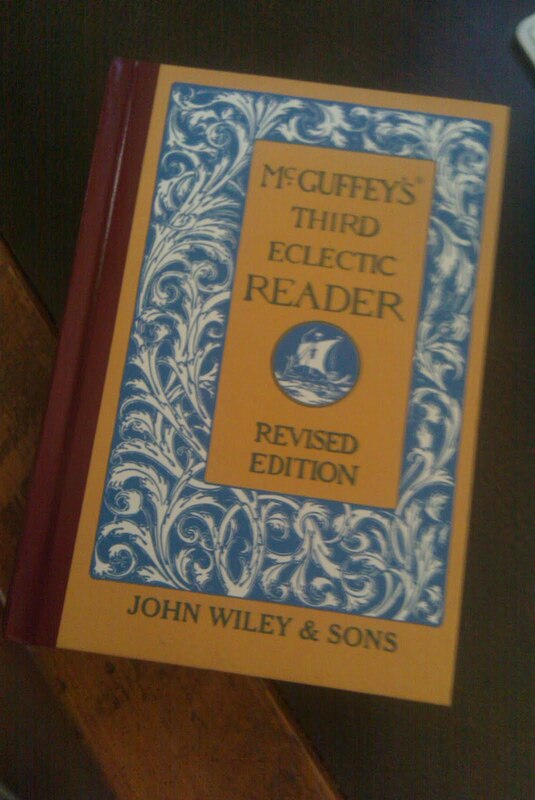 And there exist these amazing things called McGuffey's Eclectic Readers. 4) I couldn't turn down using a schooling curriculum that was first used in the late 1800's. So I clicked "add to cart on Amazon." I just went ahead and bought the whole set (Primer through level six). If you have kids or ever plan to, you may just want to go ahead and buy them now. 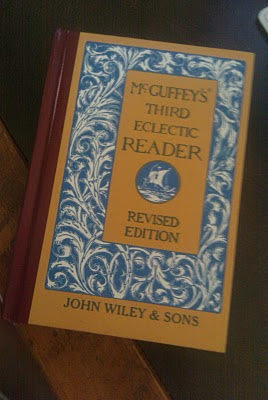 And each day Ada Brooks spends about five minutes reading a selection from this. Not for content, but for form. She reads it out loud. I then reread it out loud to her, pointing out a couple of areas she could do better. And then she reads it again, trying to do better. Then we put it down and walk away. It's about zero difficulty, zero hardness, and zero stress. And occasionally, it's kind of fun. The reason this reader is good for this purpose is that it contains all different types of writing. Prose and Poetry, Fiction and Nonfiction, even some short plays. And it varies its print among standard Times New Roman (or rather something older, but very similar), a font made to look like manuscript handwriting, and in a font made to look like basic cursive handwriting. 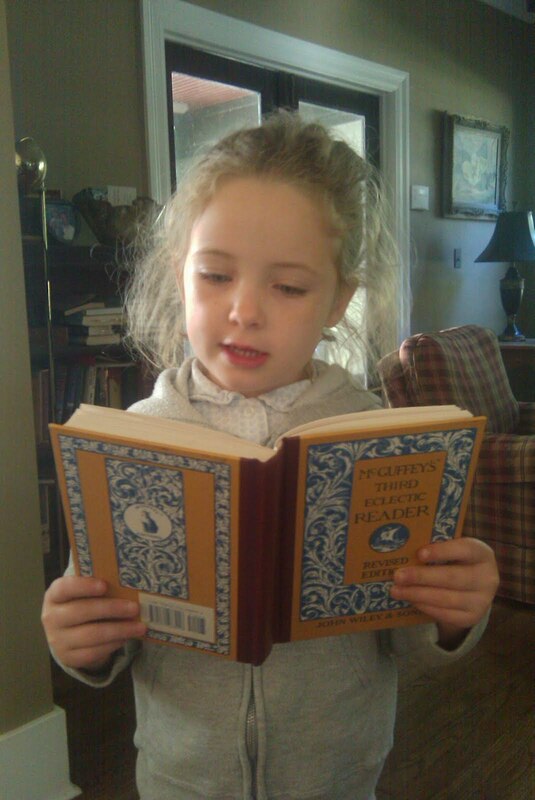 So, she's learning to read aloud anything with which she could come into contact. And even though we bought it for form, I've really been loving the content. Good, old, interesting wholesomeness. 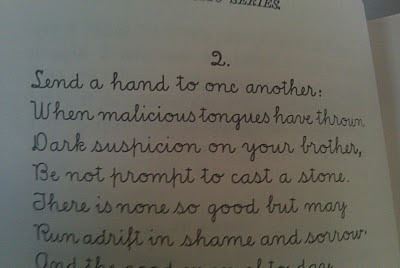 Well, this morning she came to a poem called Lend A Hand. An author was not given. I googled the first couple of lines and the best I could find was that it was printed in a book now on Google Books called A Child's Book of Religion. - which was published in 1876 and Compiled by O.B. Frothingham. I don't know Mr. Frothingham, but I wish I did. I wish I knew Mr. Frothingham because I started scrolling through the rest of the book and found a bunch of amazing jewels. Amazing ones. Really. 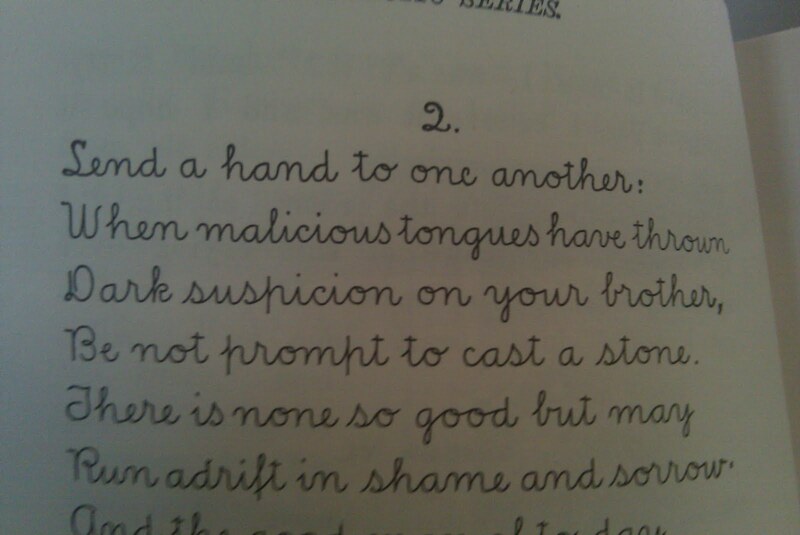 The only info given in the Google Book about Lend A Hand, Bee's reading selection for the morning, was that the poem was in A. J. Davis's Manual. A cursory google search has not turned up what this manual could be. The only two A.J. Davises are a football player and a 19th century architect. Maybe the architect also liked simple verse. I know not. The poem is great. It puts in rhyme the idea that There, but for the Grace of God, go I. (Originally attributed to John Bradford, a very brave English reformer and martyr). This is a principle we're trying to teach the kids. They could have been anyone, in any circumstance, except by God's grace. And not just could have been, but could one day be. It is the best way I've found to guard against a wrongly judgmental spirit in my own life, so I'm trying it in theirs as well. But this poems does it better than I've been able to explain it, so now that Ada Brooks has read it for out-loud work, she's added it to her list of things to memorize.